Osgood Schlatter’s Disease is a condition that comes on in childhood (typically in the teenage years), and particularly during growth spurts. 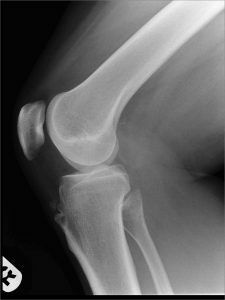 There is a growth plate at the front of the knee, where the patellar tendon attaches to the bone at the top of the front of the shin (the tibia) – and this bony prominence is called the tibial tubersosity. The bone grows from this cartilaginous growth plate. However, in some children the forces on the growth plate can be too big, in which case the growth plate hurts and it tries to lay down additional bone. The appropriate treatment for Osgood Schlatter’s is to simply listen to your knee and simply avoid whatever hurts, and just back off — even if this means temporarily giving up sport. Osgood Schlatter’s is not ‘dangerous’ in any way, and the risk of the growth plate or the tendon actually tearing/fracturing and breaking away is absolutely minimal. However, if you continue to exercise heavily with Osgood Schlatter’s then this will simply make the pain worse, plus it will simply make the lump at the front of the tibial tuberosity bigger (and this is something that you’ll then be stuck with for good, for the rest of your life). Eventually, the tibial tuberosity growth plate always fuses (by about the age of 16 or so in boys, and slightly sooner in girls). Normally, with this the pain then simply settles, and as the symptoms resolve that people are able to resume normal activities and sport. X-ray of a patient’s knee, looking from the side. 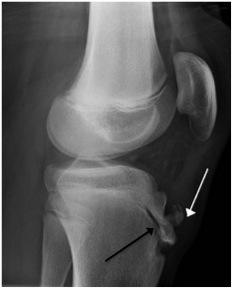 The white arrow marks the prominence of the tibial tuberosity, secondary to over-activity in / around the growth plate (marked with a black arrow) from Osgood Schlatter’s Disease. Having Osgood Schlatter’s as a kid is something that’s irrelevant for most people (apart from being left with ‘nobly knees’!). However, in a small percentage of patients, they may be left with small ‘loose’ bits of bone (called ‘ossicles’ that sit at the top of the front of the tibial tuberosity, just deep to the bottom end of the patellar tendon. These ossicles can be pinched by the patellar tendon against the front of the knee when you load the knee in a bent position (patellofemoral loading), and this can cause inflammation and pain. It doesn’t take a very large stone in your shoe for it to hurt, and for it to make you have to stop, take your shoe off and shake the stone out. Likewise, these Osgood Schlatter’s ossicles might only be small, but they can be quite irritating. If you do have pain at the front of your knee and if this is coming from an Osgood Schlatter’s ossicle, and if the symptoms are intrusive enough to justify it, then it is fairly easy and straightforward to remove these ossicles surgically, with a short day-case operation. This then normally completely cures the problem. When I was 13 years old I was diagnosed by my GP with Osgood-Schlatter’s disease (‘growing pains’) after complaining about fairly acute knee pain. For a few years this prevented me from participating in sports and other physical activities. Prior to this I was a very active child, enjoying cycling, swimming, running and hiking in equal measures. By the age of about 16 the immediate effects of the disease had worn off and I was running and cycling again with virtually no knee pains. At the age of 28 I learnt to drive and much to my annoyance a started to have knee pain again which developed in my right knee. This was aggravated by sitting down in general, but particularly when my leg was held crooked in a particular position for a long time – such as when held on the accelerator pedal, or with limited leg-room on a train or at the theatre, for example. The pain experienced from the knee was varied – sometimes just aches, occasionally sharp pains. The source of the pain was hard to identify – mostly it was coming from below the patella, other times above and to the side. It was limited to my right knee. Exercise sometimes seemed to help, other times it made it worse, particularly afterwards. This low-level pain gradually got worse over the years and in my early forties I decided to get something done about it. Following consultation with a rheumatologist, I was initially diagnosed with a misaligned patella with an inflamed fat-pad behind. An MRI scan also showed some small fissures in the cartilage which was also thought to be a contributory factor. A prescribed ultrasound-guided injection of cortisone into the fat pad helped for a few days, but nothing more. I was advised to do as much exercise as possible following the cortisone treatment, and had intensive physiotheraphy to strengthen the muscles in the glutes, leg and around the knee (to try to improve patella tracking). Although I ended up much fitter and stronger than I had been for years, I still had the pains from the knee. After a very active summer, my pains were worse than ever; on one day I could hardly walk it was so bad. There had to be more than life on painkillers! I saw Mr Ian McDermott in early 2015 and we had a set of fresh scans done. Mr McDermott noticed that there was a small bone (‘ossicle’) in the patellar tendon region of my knee which was one of the key areas where I felt pain. This had never been noticed before, either by GPs or under previous scans. David’s X-ray of his knee. 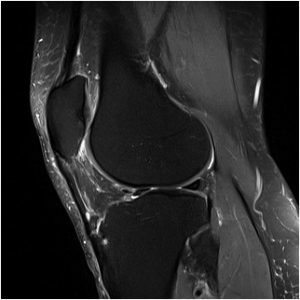 David’s MRI scan of his knee. David’s ossicles (x4!) after removal. After consultation I was given the option of surgery to remove the ossicle, and I decided to undergo the operation having tried the alternatives. 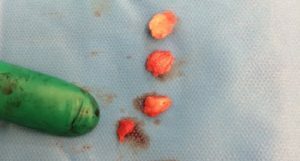 I’m pleased to say that the operation was a great success and Mr McDermott actually removed not one but four ossicles, two of which were loose (but attached to the patella tendon) and two were barely attached to the tibia. It is interesting that only one showed up under an MRI. Also the inflamed fat pad and excess plica was trimmed away. There was only very minor wear to the cartilage. After 8 weeks my rehabilitation is going very well and I am becoming active again. All the old pains which used to plague me are completely gone. I still have some way to go before I am back to full strength, but I am very confident that once I am fully recovered from the operation, that my knee will be better than it has been for years. Osgood-Schlatters is a rare disease, and ossicles which are broken off from the tibia do not happen in all cases, but it is well documented. In my case it was the main contributor to my knee pain and I only wish it had been picked up earlier in my life. I am very grateful to Mr McDermott and all the staff at London Sports Orthopaedics and London Bridge Hospital for identifying and sorting this problem out for me. In an ideal world, perhaps all people identified as having Osgood-Schlatters should be monitored for ossicles and associated knee-pain in their adult life? Information for patients about knee arthroscopic surgery: the conditions it is used to treat and the surgical procedures available. This website was developed by Mr Ian McDermott, one of London's top knee surgeons at London Sports Orthopaedics.